Hey, hey, ho, ho! That new movie’s got to go! Medical illustration: a field demanding artistic precision, and a strong stomach. What does "urban" mean to you? It's bad. It's really bad. And I can't wait to watch it. Pot politics: Will legalization hopes go up in smoke? Southern accents still come on strong. Ya'll got a problem with that? The dark side of tanning: Could it be addictive? Who put nanotechnology in my bra? Which would you men prefer? Flat stomachs or a body free of hair? 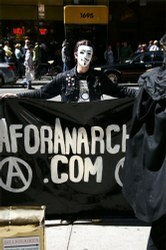 “V” may stand for vendetta, but for some protesters, "V" stands for very upset anarchists. The anti-establishment activists are complaining that the new film “V for Vendetta” misrepresents the anarchist message, and they aren’t going to take it. 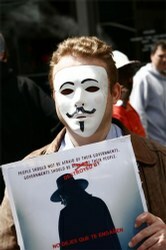 Disguised in a Zorro-like cape and mask, just like the superhero of “V for Vendetta,” James Nova drew a cardboard dagger from his belt in front of the Time Warner headquarters at Columbus Circle in Manhattan. “Totally harmless,” said Nova, poking a reporter with the duct-tape-covered blade. Nova and other members of a group called "A for Anarchy" were protesting what they consider to be a twisted version of the anarchist movement in “V for Vendetta,” the Natalie Portman blockbuster about a revolutionary superhero who blows up a totalitarian government. The protesters reenacted jousting scenes from the movie and handed out anarchist flyers on April 17 in front of Time Warner, which released the film, and outside DC Comics, which created the original "V for Vendetta" comic book. The disguised troop ended its demonstration in front of a Times Square cinema, one of many theaters where they have handed out thousands of leaflets decrying the movie since it opened in March. Real anarchists, according to Nova and other A for Anarchy members, believe in an anti-state in which violence and poverty no longer exist after authoritarian laws and governments have been abolished. They seek a peaceful society in which small communities work cooperatively and barter goods and services instead of relying on a market economy or police-backed government. The international anarchist movement has railed against communism, fascism and capitalism since aligning itself with labor movements during the 19th century. Today’s anarchists are most often linked to sometimes violent protests against institutions like the World Bank and the International Monetary Fund, which they view as serving only to widen the gap between rich and poor. “The only alternative to government is freedom,” explained Adam Weissman, 28, a slight, scraggly bearded spokesman for A for Anarchy and self-described “freegan," vegetarians and vegans who subsist on discarded produce from grocery store dumpsters. The practice is designed to cut living costs and to expose what freegans consider a wasteful consumer society. The freegan movement is one of many anarchist-allied causes that promote civic disobedience and self-reliance through events ranging from urban bicycle rallies known as Critical Mass to the distribution of free meals through collectives like Food Not Bombs. Hollywood discarded that message in “V for Vendetta,” the anarchists say, in favor of senseless violence and explosive special effects. A for Anarchy isn’t the only group upset with the movie--anarchist groups from Michigan to Madrid have also protested the film. Alan Moore, the iconic British comic book writer and anarchist who penned the original “V for Vendetta” graphic novel, removed his name from the Time Warner credits because he felt it strayed too far from the novel’s original anti-government message. Moore and illustrator David Lloyd wrote the novel in 1989 in part to protest what they considered the authoritarian policies of Margaret Thatcher, who at the time was prime minister of Britain. Passers-by who witnessed the anarchists costumed in “V” masks and performing skits from the movie were mostly bewildered, unsure why the anarchists would reenact scenes from a film they were protesting. “Their messages didn’t come through very clear, and it just seemed like they were the only ones who really cared,” said Megan Green, a fan of the “V for Vendetta” comic book who was wearing a camouflage jacket and Dr. Martens boots. She came upon the demonstration while out for lunch. Rivals of the anarchists had stronger opinions, and a brief standoff ensued when self-touted “anarcho-capitalists”--libertarians clad in identical “V” masks and red “D for Diplomacy” badges--arrived at DC Comics to counter-protest and mock their leftist opponents. “I think they probably know Rage Against the Machine better than they know economics,” said libertarian front man Todd Seavey, who clenched his gloved fists before a small audience of bewildered office workers on smoking breaks and tourists waiting in line for David Letterman tickets. “If they really understood economics, I think they would see capitalism, Hollywood and comic books as liberating forces rather than the enemy,” Seavey added. A confrontation between the two groups was avoided, but evil looks and insults were exchanged before the libertarians--mostly office workers and executives who had turned out on their lunch break--returned to work. “Go get your 401(k),” shouted one anarchist clad in black. “They’re a bunch of tools,” Seavey told his onlookers. Warner Brothers and DC Comics wouldn’t comment on the protest. David Graeber, an anarchist scholar and professor at Yale, doesn’t consider the movie a travesty of the anarchist reality. “It didn’t upset me much,” Graeber said. “I thought the message of anarchy got out in spite of Hollywood.